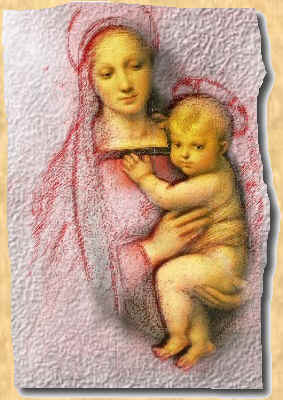 "The Mary that we know as Catholics," is the Mother of God, because She is the Mother of Jesus the Son of God who is One with the Father, and who is also man and God.We are very fond of Our Lady because She is our refuge and our help, She was given to us at the foot of the cross to be our Mother, when Our Lord said to John: "Behold your Mother"
"Let it be done to me according to your Word" she said to the angel Gabriel, teaching us to do the Will of God. We call Mary "Our Lady," a title that next to "Our Lord" means a great deal of respect, and She deserves all the honours that can be given, because She is the Mother of Our Savior, the cause of our Joy and because She is our Heavenly Mother. It is during Mary's presence at the Cross that her future role in the development of Christianity is unveiled. "When Jesus saw his mother and the disciple there whom he loved, he said to his mother, 'Woman, behold your son.' Then he said to the disciple, `Behold, your mother. '"(John 19:26). The use of the word "woman" in this context is unusual. Jesus, like any loving Jewish son of His time, would address His mother with more affection than the use of "woman" seems to indicate. However, Jesus is quoted at the crucifixion and at the wedding at Cana as referring to His mother as "woman". This is likely a reference to the Genesis description of the savior, "I will put enmity between you and the woman, and between your offspring and hers; he will strike your head, and you will strike his heel" (Gen 3:15). In this statement, God promises humanity salvation through the woman of Genesis; her offspring will crush the head of the serpent. This is Jesus' way of reminding all that He is the salvation promised by His Father. He reminds us that God always keeps His covenant. By giving His mother to the disciple at the Cross, she becomes the Mother of all Jesus' followers and the Mother to His Church. It is in this role that she has appeared to the pious throughout history. In the year 39 AD, according to tradition, the Virgin Mary appeared to Saint James the Great, in Zaragoza, Spain. The vision is now called Our Lady of the Pillar and is the only reported Marian apparition before her Assumption. The Basilica of Our Lady of the Pillar was built in Zaragoza, Spain and a key piece of Roman Catholic Marian art, the statue of Our Lady of the Pillar, refers to this apparition. Our Lady of the Snows is based on a legend that during the pontificate of Pope Liberius, during the night of August the 5th, snow fell on the summit of the Esquiline Hill in Rome. And based on a vision that same night a basilica was built in honour of Our Lady, on the spot which was covered with snow. The church built there is now the basilica of Santa Maria Maggiore and the feast was celebrated at that church for centuries on August 5 each year. However, there was no of mention of this alleged miracle in historical records until a few hundred years later, not even by Pope Sixtus III in his dedicatory inscription, and it may be that the legend has no historical basis. However, in the 14th century the feast was extended to all the churches of Rome and finally it was made a universal feast by Pope Pius V.
The Blessed Virgin Mary is said to have appeared to Saint Simon Stock, who was Prior General of the Carmelite Order in the mid 13th century. The earliest reference to the tradition of his Marian apparition, dating from the late 14th century, states that "St. Simon was an Englishman, a man of great holiness and devotion, who always in his prayers asked the Virgin to favor his Order with some singular privilege. The Virgin appeared to him holding the Brown Scapular in her hand saying, 'This is for you and yours a privilege; the one who dies in it will be saved.'" A scapular is an apron-like garment that forms part of the Carmelite religious habit, and in the original context the Blessed Virgin Mary's promise was an assurance that religious who persevered in their vocation would be saved; beginning in the latter half of the 16th century the small devotional scapular became very popular as a sacramental. The historicity of Saint Simon Stock's vision is disputed, and as a result today neither the liturgy for the Feast of Our Lady of Mount Carmel (which originally had no association with scapular devotion, but began to be strongly connected with Saint Simon Stock's vision in the 17th century), nor that of Saint Simon Stock make any reference to the vision of Mary or the scapular. The Brown Scapular itself remains warmly approved and recommended by the Catholic Church. Various devotional sources quote an interview with Lucia Santos in which she speaks about the Brown Scapular, saying "Our Lady wants all to wear the Scapular", especially when praying the Rosary, because "the Rosary and Scapular are inseparable". The 1531 apparition of Our Lady of Guadalupe was reported by Saint Juan Diego. He said he saw an early morning vision of the Virgin Mary in which he was instructed to build an abbey on the Hill of Tepeyac in Mexico. The local prelate did not believe his account and asked for a miraculous sign, which was later provided as an icon of Our Lady of Guadalupe permanently imprinted on the saint’s cloak where he had gathered roses. Over the years, Our Lady of Guadalupe became a symbol of the Catholic faith in Mexico and the Mexican diaspora. The apparitions of Our Lady of Laus between 1664 and 1718 in Saint-Étienne-le-Laus, France by Benoite Rencurel, a young shepherdess are the first Marian apparitions to be approved in the 21st century by the Roman Catholic Church. The apparitions were recognized by the diocese of the Roman Catholic Church on September 18, 1665. They were approved by the Vatican on May 5, 2008. Currently, the site where the apparitions took place receives more than 120,000 pilgrims a year. The vision of Our Lady of the Miraculous Medal is said to have appeared to Saint Catherine Labouré in 1830 in the convent of Rue du Bac, Paris. She reported that one night in the chapel, the Blessed Virgin Mary appeared to her and asked that a medallion be made to a design that she dictated. The lady added that, "All who wear this medal will receive great graces." After spending two years examining her claims, her priest eventually took the information to his archbishop. The medal eventually produced came to be referred to as the Miraculous Medal. The front of the medal displays a picture of the virgin as she appeared to Catherine Labouré. The design on the reverse includes the letter M and a cross. Pope John Paul II used a slight variation of the reverse image as his coat of arms, the Marian Cross. This is a plain cross with an M underneath the right-hand bar, to signify the Blessed Virgin standing at the foot of the Cross while Jesus was being crucified. Sister Justine Bisqueyburu is said to have also had an apparition in 1840 within the same chapel at Rue du Bac as Saint Catherine Labouré. These visitations instituted the Green Scapular which involves a very simple devotion to the Immaculate Heart of Mary and is associated with healing. The Green Scapular has its own association but has not yet been approved by the Holy See and does not have an associated confraternity. The apparitions of Our Lady of La Salette were reported in La Salette in France in 1846 by two shepherd children, Mélanie Calvat and Maximin Giraud, followed by numerous accounts of miraculous healings. The Roman Catholic Church investigated the claims and found them to be basically credible. However, in the late 19th century controversy surrounded the claims of one of the seers, Mélanie Calvat in a France hostile to religion. Recent releases from the Vatican Secret Archives may have clarified the situation to some extent, but some controversy still remains attached to this apparition. In 1858 Saint Bernadette Soubirous was a 14-year-old shepherd girl who lived near the town of Lourdes in France. One day she reported a vision of a miraculous Lady who identified Herself as "the Immaculate Conception" in subsequent visions. In the second vision she was asked to return again and she had 18 visions overall. According to Saint Bernadette, the Lady held a string of Rosary beads and led Saint Bernadette to the discovery of a buried spring, also requesting that the local priests build a chapel at the site of the visions and lead holy processions there. Eventually, a number of chapels and churches were built at Lourdes as the Sanctuary of Our Lady of Lourdes - which is now a major Catholic pilgrimage site. One of these churches, the Basilica of St. Pius X can accommodate 25,000 people and was dedicated by the future Pope John XXIII when he was the Papal Nuncio to France. The apparitions at Our Lady of Pontmain, France also called Our Lady of Hope were reported in 1871 by a number of young children.The final approval for the apparitions of Our Lady of Hope was given in 1932 by Eugenio Cardinal Pacelli, who later became Pope Pius XII. The visions of the Virgin Mary appearing to three shepherd children at Our Lady of Fátima in Portugal in 1917 were declared worthy of belief by the Catholic Church in 1930. Four popes — Pope Pius XII, Pope John XXIII, Pope Paul VI and Pope John Paul II — have supported the Fatima messages as supernatural. Pope John Paul II was particularly attached to Fátima and credited Our Lady of Fátima with saving his life after he was shot in Rome on the Feast Day of Our Lady of Fátima in May 1981. He donated the bullet that wounded him on that day to the Sanctuary of Our Lady of Fátima. In 1925, eight years after the Fátima events, Lúcia Santos reported another set of apparitions, which became known as the Pontevedra apparitions. The 33 apparitions of Our Lady of Beauraing were reported in Belgium between November 1932 and January 1933 by five local children ranging in age from 9 to 15 years. From 1933 to World War II, pilgrims flocked to the little village of Beauraing. The final approbation for the apparition was granted on July 2, 1949 under the authority of the Holy Office by the decree of Andre-Marie Charue, Bishop of Namur, Belgium. These apparitions are also known as the Virgin of the Golden Heart. Beco reported eight visions of the Blessed Virgin Mary between January 15 and March 2, 1933. She reported seeing a Lady in White who declared herself to be the Virgin of the Poor and told her: "Believe in me and I will believe in you". In one vision, the Lady reportedly asked Mariette to drink from a small spring and later said that the spring was for healing. Over time the site drew pilgrims. Today, the small spring yields about 2,000 gallons of water a day with many reports of miraculous healings. The apparitions of Our Lady of Akita were reported in 1973 by Sister Agnes Katsuko Sasagawa in the remote area of Yuzawadai, near the city of Akita in Japan. For several decades, Agnes Sasagawa had encountered many health problems but her health reportedly improved after drinking water from Lourdes. After going totally deaf, she went to live with the nuns in the remoteness of Yuzawadai. In 1973 she reported apparitions of the Virgin Mary, as well as stigmata and a weeping statue of the Virgin Mary which continued to weep over the next 6 years on 101 occasions. According to EWTN, in June 1988 Joseph Cardinal Ratzinger (later Pope Benedict XVI) as Prefect of the Congregation for the Doctrine of the Faith, gave definitive judgement on Our Lady of Akita events and messages as reliable and worthy of belief. A number of claimed apparitions sites which have yet to be fully approved continue to gather pilgrims and become the site of major Marian basilicas. The apparitions at these sites are often the subject of legends. An example is Our Lady of Walsingham where according to legend the Blessed Virgin appeared in a vision to a noblewoman in 1061 and her son built a simple wooden structure there which later became an abbey. No details of the content of vision have been preserved, but pilgrims continued to arrive at Walsingham for centuries until 1st Earl of Sussex destroyed it in 1538. The 1490 apparition reported by Italian peasant Benedetto Pareto regarding Our Lady of Guardia is somewhat similar, but has a happier ending. Pareto also reported that the Virgin Mary appeared to him and asked him to build a church atop the mountain. Pareto at first refused, saying that he was just a poor man, but he eventually built a small wooden structure which in time gathered many pilgrims. The Shrine of Our Lady of Guardia is now a thriving basilica atop Mount Figogna, near Genoa Italy. Some major Marian basilicas and traditions are based on legends that do not involve any specific apparitions, but sacred objects that are assumed to have been associated with apparitions. The key example is the Basilica of the National Shrine of Our Lady of Aparecida in Aparecida, Brazil. It is the second-largest Catholic place of worship in the world, second only to St. Peter's Basilica in Vatican City, and the largest Marian Church in the world, receiving over 6 million pilgrims a year. There is no specific vision or apparition associated with Our Lady of Aparecida, and it is based on a simple wooden statue of the Blessed Virgin (found by fishermen) which over the centuries drew millions of pilgrims, based on its reported healing powers. The festivals surrounding Our Lady of Chiquinquirá in Venezuela are based on a piece of wood which according to legend grew luminous with the image of the Blessed Virgin in 1709. In the case of Our Lady of Kazan, legend holds that the Blessed Virgin revealed the location of the precious icon to a 10 year old girl in 1579. The Basilica of Our Lady of Good Health in Tamil Nadu in southern India does however have a legend that involves a number of apparitions. There is no historical record of the apparition of Our Lady of Good Health but the oral tradition suggests that there was an apparition to a Hindu boy in mid 16th century and later Portuguese sailors were saved by another apparition.Also another one major Marian apparitions in India is of Korattymuthy at Koratty in Kerala. Similarly, the legend Our Lady of La Vang is based on an apparition to a group of Vietnamese Catholics in the rain forest in 1798, and the site of a basilica. Although both She Shan Basilica in Shanghai, China and Our Lady of China in Donglu, near Beijing, were popular pilgrimage sites at one time, with the arrest and imprisonment of the Catholic bishops in the 1950s by the communists and with the establishment of the Chinese Patriotic Catholic Association against the Vatican, these pilgrimages have slowed down. The Sanctuary of Our Lady of Lichen, the largest church in Poland (and the 11th largest in the world) is based on legends on the Virgin Mary appearing to different people in the Lichen area in the early 19th century. The Basilica of Our Lady of Knock in Ireland is based on a reported appearance of the Virgin Mary along with Jesus Christ and other saints in Ireland in 1879. The Basilica of our Our Lady of Siluva in Siluva, Lithuania is also based on a legend of an apparition to four children in 1608, and houses a famous painting (perhaps based on Salus Populi Romani) called Our Lady of Siluva, usually considered Lithuania's greatest treasure. Among recent visions, the reported apparitions of The Virgin Mary to six children in Međugorje in 1981 have received the widest amount of attention. The Our Lady of Međugorje messages are published and distributed worldwide and often emphasize five key elements: Daily prayer of the Holy Rosary, Fasting on Wednesdays and Fridays, Daily reading of the Bible, Monthly Confessions and Holy Communion. The Međugorje messages have a very strong following among Catholics worldwide. The Holy See has never officially either approved or disapproved of the messages of Međugorje, although both critical and supportive documents about the messages have been published by various Catholic figures. On March 17, 2010, the Vatican announced it was beginning a formal investigation of the apparitions at Medugorje. Cardinal Camillo Ruini is to head the commission that will study the matter. The apparitions of Our Lady of Good Help were reported by Adele Brise in 1859. In December 2010, Bishop David L. Ricken of Green Bay, Wisconsin approved the apparition as worthy of belief, as the first Marian apparition to be approved in the United States at the local level. Catholics and the Orthodox maintain Mary is the most important human being in God's plan, except for her Son, the God-Man, Jesus. Others think that by honoring Mary we take away from the worship of Jesus. However, Catholics and the Orthodox say Mary will lead a person to Jesus, just as all good Christians try to lead their friends to the Lord. After all, Mary's last recorded words in the Bible were: "Do whatever He (Jesus) tells you" (Jn 2:5). What is Mary's part in God's plan? Does she mother, minister, and intercede today? The teachings about Mary depend on two Biblical revelations about her motherhood. Mary is God's mother as she is the mother of Jesus Who is God (Lk 1:32, 35). She is also our Mother by adoption because Jesus told her to take John and the disciples of all time as her children (Jn 19:26). Mary is not just the average person; she is God's mother, having conceived Jesus by the overshadowing of the Holy Spirit. If we understand God's holiness and the intimacy of the Holy Spirit with Mary in conceiving Jesus, we see that Jesus' incarnation presupposes that Mary was immaculate from the beginning of her life. Because Mary was free from sin, she was free from the wages of sin, that is, death (Rm 6:23). Thus her immaculate conception implies her assumption into heaven. This does not take away from the glory of her Son or imply she did not need to be redeemed (see Lk 1:47). In fact, it is an even greater victory for Jesus. Pope Pius XII taught: "Wherefore, the infinite dignity of Jesus Christ and His office of universal redemption is not diminished or lowered by this tenet of doctrine, rather it is greatly increased" (On the Immaculate Conception, p. 5). In the Bible, Mary is called "full of grace" and "blessed among women" (Lk 1:28, 42, 45). We have begun to appreciate how blessed and graced she was and why "all ages to come" shall call her blessed (Lk 1:48). Because of Jesus' resurrection victory over death, her mothering is not stopped by her passing from this life to heaven. Mary's "unique," "preeminent," "singular," and yet very human place in God's plan of salvation is not only for two thousand years ago but for today (Vatican II, The Church, 53). While Jesus was hanging on the cross He told mother Mary to adopt John and the disciples of all time as her children. Mary obeyed her Son and she mothers us until the present day. Now we must obey Him by accepting and honoring her as our mother, thereby obeying the fourth commandment (Ex 20:12). This commandment carries with it the promise that it will go well with us and we will have a long life (Eph 6:3). This applies both to our natural parents and our adoptive mother. By honoring mother Mary we claim God's precious promises. We know Mary is still mothering us by what the Spirit has taught us concerning John 19:25-27 and also by the Spirit's gift of prophecy. For example, when Isaiah prophesied: "The virgin shall be with Child, and bear a Son, and shall name Him Immanuel" (Is 7:14), probably no one understood this to mean that a virgin would conceive without sexual relations. But the Spirit later revealed this through Matthew: "He (Joseph) had no relations with her at any time before she bore a Son, Whom he named Jesus" (Mt 1:23, 25). The Spirit has taken other Bible passages and given them a prophetic meaning concerning Mary (e.g. Gn 3:15; Rv 12:1). These prophecies have been tested by Christian communities across the world for centuries (see 1 Jn 4:1) and therefore are among the most confirmed and tested prophecies in the history of Christianity. They help us further appreciate Mary's special mothering role in God's plan of salvation. Micah prophesied, "Therefore the Lord will give them up, until the time when she who is to give birth has borne" (Mi 5:2). As the Spirit overshadows our understanding by teaching us His word and pouring out the gift of prophecy, we become more aware of how Mary continues to mother the church. The titles of Mary are usually prophetic statements about aspects of her mothering. As Sorrowful Mother, she has the gift to lay bare the thoughts of many hearts. As Our Lady Of Perpetual Help, she exercises a powerful intercessory ministry (Jn 2:3). As Spouse of the Spirit, she prays for a new Pentecost, as she prayed at the first outpouring of the Spirit (Acts 1:14). As Our Lady Of Lourdes, she heals her children. As Our Lady Of Guadalupe, she evangelizes and ministers to the poor. As Our Lady of Fatima, she asks us to accept Jesus' call to be peacemakers (Mt 5:9). All these ministries are aspects of motherhood. Mothers are primarily concerned about peace among the children in their family. Mothers live to lead their children to Christ. They intercede for, heal, and serve their children. They often minister the Spirit to their children. That same Spirit that Mary prayed for at the first Pentecost now teaches us to appreciate her mothering and to honor her as mother. As a youngster I came to know Mary as my mother. We prayed the family rosary each evening, and this prayer-time bore fruit in an exceptional family life. I stayed in touch with Mary throughout high school and college but almost forgot about her in graduate school. I no longer prayed the rosary daily, for I had become too sophisticated for such a simple prayer. My life was deteriorating gradually. My estrangement from Mary was symptomatic of a breakdown of my relationship with Jesus; I still went to church and prayed but had lost my first love (see Rv 2:4). I was compromised with the world and no longer loved Jesus with all my heart and soul (Mt 22:37). I was experiencing meaninglessness and powerlessness in my life. In l975, one year after my ordination to the priesthood and one week before Pentecost, after reading Acts 1:14 as I was preparing for the Sunday homily, I decided to gather some people to pray for the Spirit. The Spirit came in a torrential outpouring, and almost immediately the Spirit restored my relationship with Mary and my daily praying of the rosary. The first time I prayed in tongues was during the rosary. One of the most effective evangelistic outreaches I have ever witnessed was the result of a rosary procession. Also, the only time I have seen the Spirit renew a parish extensively was through the intercession of Our Lady of The Presentation. The Spirit is using Mary now to prepare the way for her Son's final coming. In 1917 at Fatima, Portugal, Mary prophesied that Russia could be converted and her immaculate heart would triumph. We hear of revival in Eastern Europe, Russia, and China. These events seem to be preparing for the miraculous fulfillment of the Fatima prophecies and a worldwide evangelistic explosion. As the Lord's plan of salvation unfolds and culminates, the Lord seems to have commissioned Mary to prepare us for His second coming. Therefore, He asks us to dedicate ourselves to Mary's immaculate heart. The revelation of Mary's immaculate heart is one of the most confirmed prophecies of all time. Our dedication to her immaculate heart is a commitment to lay bare our hearts (Lk 2:35) and receive new hearts that are holy, immaculate, and pleasing to the Lord. It means that we accept Mary's mothering and agree to cooperate with her as she ministers the Holy Spirit to us, as she did with Elizabeth and John the Baptist (Lk 1:41). Great athletes or musicians dedicate themselves through strict obedience and extensive work to a professional coach or virtuoso. Likewise, to be holy we need to be discipled by others, especially our mother Mary. Wearing the scapular is a sign that we have decided to cooperate fully with Mary as she makes us disciples of her Son Jesus. "Mother Mary, thank you for loving Jesus and being my mother. I dedicate myself to your immaculate heart. I ask you to pray for, teach, command, correct, and guide me. I commit myself to cooperate with and obey you so I will grow to love Jesus with all my heart and stand holy before Him when He comes a second time." Nihil obstat: Reverend Ralph J. Lawrence, July 14, 1998. Imprimatur: Most Reverend Carl K. Moeddel, Vicar General and Auxiliary Bishop of the Archdiocese of Cincinnati, July 20, 1998.